When I featured a commercial brand of Tum Yum Soup Paste in a recent post, it struck me that the paste, in addition to a number of non-soup applications, might be nice flavor base for fried rice and, since I had half a fresh pineapple, I thought I might combine the two. 1 tbsp. Tom Yum Soup Paste (or a red Thai Curry Paste). 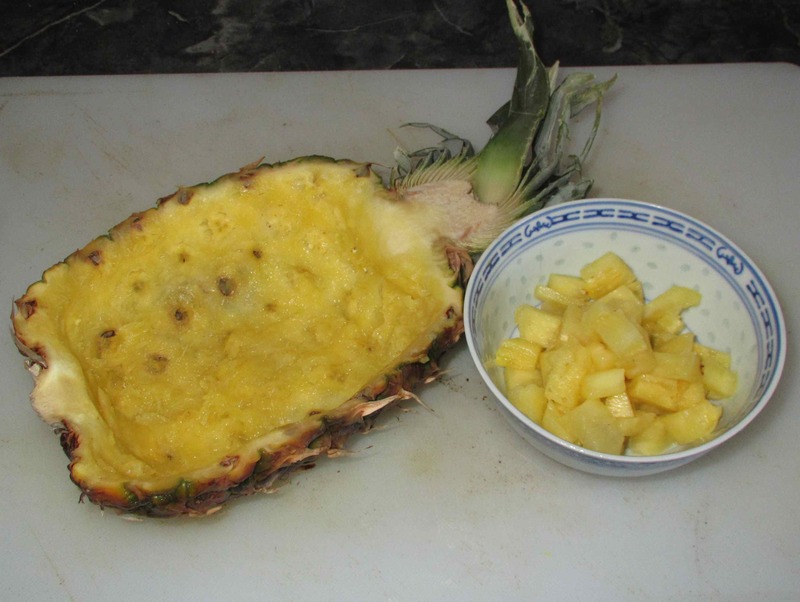 Here is the hollowed-out half-pineapple along with the flesh I will be using in this recipe. Obviously, this is just a small portion of the total flesh to come from just this half of the fruit but the rest will be put to good use. 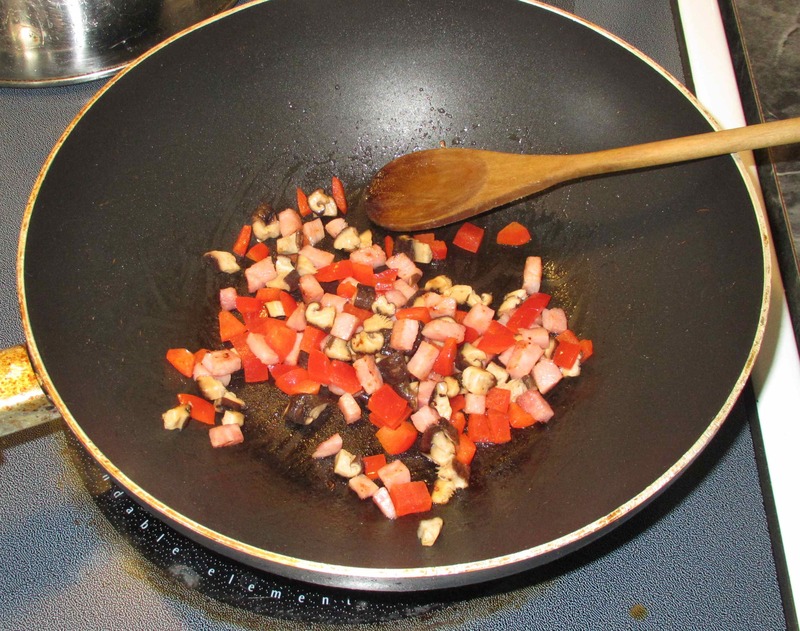 Heat a tablespoon or so of oil in a sauté pan over a medium flame, then add the ham, chopped mushroom and red pepper. Stir-fry until you can smell the aroma of the ham. Now add the cuttlefish, green pepper and the tom yum paste. Stir to coat the rice grains with the paste and let everything get heated well through. Finally, add the pineapple and continue stirring until it is hot as well and then transfer the contents to your pineapple shell. Garnish as you see fit (I used a few celery leaves and a Thai chili), and then serve immediately. I had pineapple fried rice last week at a local Thai restaurant and I was so disappointed so I went home and made it myself at the weekend. I used chicken for the meat, and fish sauce and soya sauce for the base for the sauce with garlic, ginger and chili, cumin and corriander. I didn’t have cashews so I used pistachio instead. Mine was better. 🙂 I didn’t serve mine in the pineapple half. Yours looks delicious. Thank you. On the day I made it, my wife was away so I just tasted a little and then kept it wrapped in the fridge until her return the next day. I then pooped it into the microwave, added some cashews and it was even better than the day before! I am waiting I bet the next post you are going to start carving some ornate swans out of your pineapple . I don’t make this often at home but your version looks very nice . LOL … I actually have a few books on food carving but I really haven’t tried anything that ambitious! 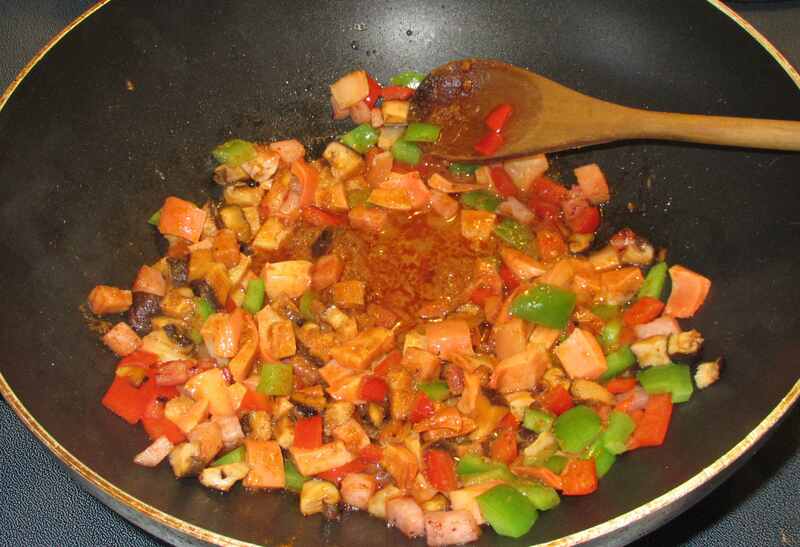 What a good idea of using the base in your stir fried rice…the end result sounds terrific. Love Thai food! The rice stir-fry looks so delectable! I love pineapple fried rice! This looks amazing! Great idea! Coincidently, I bought some Tom Yum paste last weekend and though I might try it in a Pad Thai style dish (I was also looking at alternatives to soup – small world!). I’m sure it would be as good with noodles as rice! 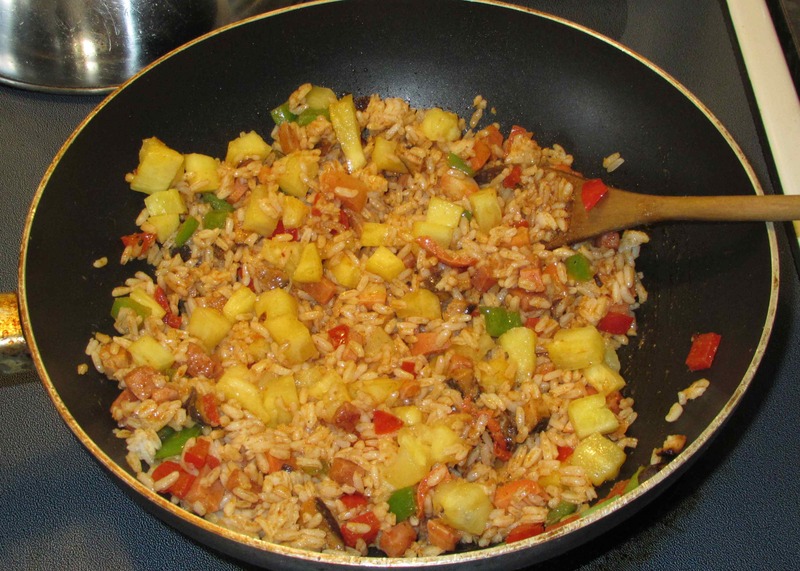 I adore pineapple fried rice and a I always add a little finely chopped fresh chili to it to bring out the sweetness of the pineapple. Tom Yum paste might be similar to that. Love the presentation. It’s so fun. This would be great for a pot luck. Inexpensive and with a wow factor. Maybe have one vegetarian fried rice in one half and a meat one in the half so people get to choose. This is a very popular dish . The fact that you really carved out a pineapple, really deserves my respect. It is a lot if work . People usually do this if they invite guests for dinner. I probably made something simikar but not with a pineapple shell as a plate, not at home. It looks like that you are really successful! Actually, hollowing out the pineapple wasn’t as hard as I thought. Although, one of those curved-tip knives used for grapefruit would have made it even easier! I just know the pineapple brings out the wonderful flavor of this fried rice. I just love how delish this dish looks. 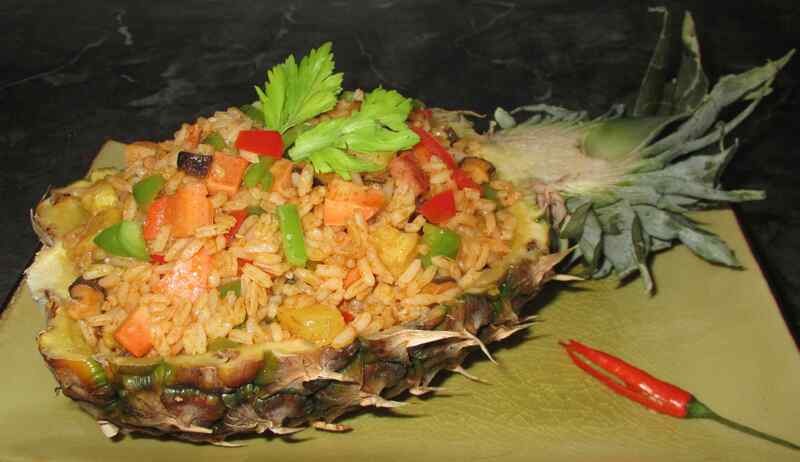 Love the idea of putting this dish inside the pineapple – all about presentation!